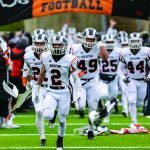 Despite losing their final regular season game against East Kentwood on Friday, October 19th and falling short of the guaranteed entry into the playoffs with six wins, Rockford is in the field of 256 thanks to a difficult schedule. 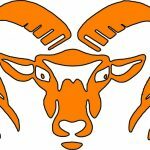 The Rams actually got in with a bit of room to spare thanks to the strength of their opponent’s records that they both defeated and lost to over the course of a 5-4 season. Getting in was the hope and that has come to fruition for Rockford. As a reward the Rams will travel to Traverse City to take on the Titans of Traverse City West High School. Traverse City West will enter the fray with a record of 7-2. The game will be played on Friday, October 26th at 7:00 P.M. at Thirlby Field in downtown Traverse City. The venerable stadium has been around for years and has no track surrounding the field which makes for an up close and personal viewing experience for the fans. 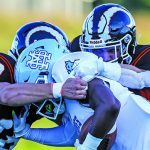 The two teams have met a grand total of eight times historically with Rockford having emerged victorious on all eight occasions. The last meeting between the two schools came in 2014 and saw the Titans come as close as they ever have before falling to Rockford by the score of 20-14. The Titans are a team that has made their mark in 2018 on the back of a stout defense that has allowed only 91 points on the campaign. The most points they have surrendered in a contest is 16. Conversely, they have only scored more than 21 points a grand total of once thus far, and that was the 42 they put up against a one-win contingent from Cadillac. The average score of a game amounted to 19-10 for the duration of the season. Rockford on the other hand has an average outcome of 26 to 18 while having played a decidedly more difficult schedule. The one common opponent was Grand Haven which defeated TC West 13-10 early in the year and fell to the Rams 21-0 in the middle of the season. The other half of the bracket is an all OK Red affair with Hudsonville squaring off with West Ottawa. The winners of the two games will meet the following week (probably next Friday) with the winner advancing to the Regionals.